This guide to apples tells you everything you need to know about 9 different varieties. Learn which ones are best for eating fresh, cooking and baking. With the first day of fall just 2 days away, it seemed like the appropriate time to talk about apples. If we’re being honest, apples are pretty much on the bottom of my fruit totem pole. They’ll never even come close to competing with my beloved peaches or any berries for that matter but, they’re what fall gives us, especially in New York and I can’t say I don’t enjoy a few slices with some sharp cheddar or an apple cheddar crumble bar (an apple without cheese is like a hug without a squeeze) every now and then as a snack. For this month’s seasonal eating post with my partner, Silk we’re talking about everything there is to know when it comes to apples. I went to my local market, picked up one of each of all the varieties they had available. So while this isn’t a comprehensive list of every apple out there (there are FAR too many to do that), it’s what’s local to me right now and I’m pretty sure you’ll find a few of your favorites on the list. I figured I’d start with the all-time favorite of most apple eaters out there. Honeycrisp are considered one of the best (if not the best) fresh eating apples out there. They’re crisp and a bit sweet, with an undertone of honey flavor, just as their name suggests. They’re also great for making applesauce if you don’t eat them all first! Thought to be a descendant of McIntosh, Paula Reds are similar in that you can both eat them fresh and cook with them. They have a dustier exterior appearance and are just a bit tart as well as sweet. They become very soft when cooked which lends them perfectly to applesauce. Fujis are big (check them out below versus the others!). They’re a sweet apple that was originally crossed with a Red Delicious. Fujis will keep well for weeks in a fruit bowl on your counter. Their sweetness makes them great for eating raw or in salads and slaws. Red Delicious are one of the most popular apples grown in the United States. They’re available year round and a great snacking apple. While never a favorite of mine, they’re a sweet apple that many like. They’re best kept in the refrigerator to maintain their texture and freshness. Their soft interior doesn’t lend them too well to baking. Ginger golds are a descendant of the Golden Delicious apple which is pretty obvious from their resemblance. They’re sweet and mildly tart but the neatest thing about them is that when cut, their flesh doesn’t oxidize (turn brown) right away like many other apples. They hold their shape well when cooked and are great in pies. They’ll also last for about 3 months if stored in the refrigerator. Galas resemble the Red Delicious or Golden Delicious in shape (taller than it is wide). They’re similar to Fuji in that they’re great for eating raw thanks to their thin skin and sweet taste. Galas are not great for cooking as they become rubbery and lose their fragrance. Stick to snacking on them or throwing them in salads and such. Gala apples are great for cider too! Cripps Pink (also referred to as Pink Lady) apples are a great all-around apple. Their firm, crisp flesh has a tangy-tart and sweet flavor that is great for both eating raw and baking/cooking. They’re also slow to oxidize which makes for a great addition to a cheese/appetizer platter. Cortlands are regarded for their all-around use in cooking and baking. Many leave the skin on when making applesauce with this apple for a pretty shade of pink when pureed. They’re great for apple pie, applesauce and apple butter (like in this savory thyme pear apple butter). Granny Smiths are very tart apples with a bright green skin making them hard to miss or forget once you’ve taken a bite! If you love a tart apple (like me! ), this is the one for you to eat raw. Most though, prefer to cook with the Granny Smith as it holds up very well when heated and provides a great contrast in flavor to savory dishes. I only have eyes for cortland ;) Half teasing. 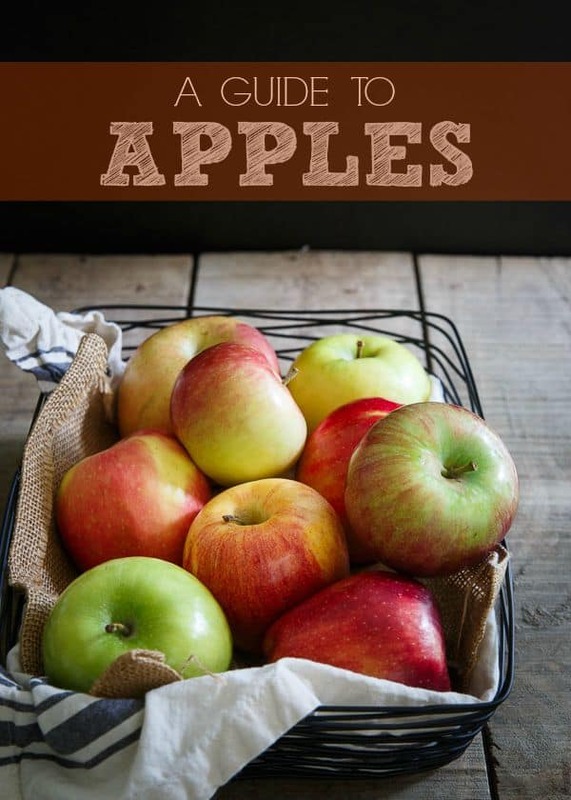 Love this guide to apples! Honeycrisps are my favorite for just eating but I love Granny Smith for dipping in peanut butter. Great guide! I just picked up some Paula Red for the first time! But my ultimate 2 favs are Fuji and Pacific Rose! This is some great info for apple picking season! Super useful guide, and I love your animated photo! Oh how we loooooooooove apples at our house! ginger gold are my fav! I can’t wait to go apple picking soon! Peaches are my favorite, too, but you’d never know it with all the apple desserts I’ve been making lately! Thanks for your handy guide to apples! Great information and tips. I’m partial to Gala and Fuji. Your animation is super cool, too! I am totally addicted to honey crisp but I seriously love all apples, I think it’s by go-to health food, ha! Great guide, there’s a few of these that are new to me. I showed this to my son, who studied apples in school last year, and he was so excited to learn about more varieties. He’s a honeycrisp fan, I’m loyal to red delicious. Love fall apples!! I know! I was shocked they weren’t available in the store. They’re a pretty common one around here, not sure why they didn’t have them. Gina, I LOVE your fruit guides! I’ve never tried the Paula Red or the Ginger Gold before, so I’ll have to keep an eye out for them! An apple without cheese is like a hug without a squeeze… I love it! I have an apple with cheddar almost every day – Honeycrisp if they’re available and Gala or Fuji if not. Such a fun guide! Keeping this bookmarked for a handy reference! Honeycrisp are a favorite of mine!! I also love the gold rush apples, but I’ve only found them in farmers markets in DC and SF. Honey crisp are my favorite! I love to eat them with some cinnamon and a sprinkle of salt :) It’s funny I also love Pink Ladies but I haven’t seen them anywhere this year!